The pattern on the floor is the order to follow the numbers+arrows: 4Down, 8UpRight, 8Left, 8DownRight, 1Up, 2Left, 8Up, and 1Left. 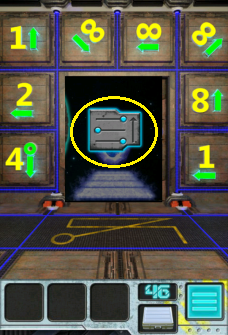 Start at the glowing 0, count down 4 numbers (to column 1 row 5) and that's the first symbol to press. Follow the rest of the Number/Arrows and tap those symbols. Solution: Column 1 Row 5, Column 4 Row 2, Column 1 Row 2, Column 4 Row 5, Column 4 Row 4, Column 2 Row 4, Column 2 Row 1, Column 1 Row 1. 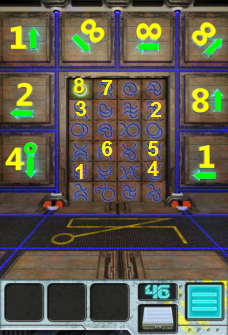 Proceed to the next 100 Doors Aliens Space level!